FAYETTEVILLE, Ark. – The University of Arkansas men’s basketball program invites you to join the players and staff at the 2018 Razorback Men’s Basketball Awards Dinner, presented by First Security, on Monday, April 9 at Bud Walton Arena. Doors will open at 6:30 p.m. with the event beginning at 7 p.m. Tickets are $25 per person or $300 to reserve a table of 10 and are currently available for purchase by clicking here. For VIP tables, call 479-575-3118 or email Amanda Creamer at akcreame@uark.edu. Fans have the opportunity to enjoy dinner on the court at Bud Walton Arena, meet the team and coaches and hear from many of them throughout the evening. Coach Anderson and his staff will also present various awards to the players, including the Heart of a Razorback Award, the Most Improved Player Award and the Most Outstanding Player Award. Ending the year with a 23-12 overall record, Arkansas won eight of its final 12 games to advance to the NCAA Tournament for a third time in a four-year span for the first time in 10 years. It marked the 11th time in his 16-year coaching career that head coach Mike Anderson led his team to a 20-win season, including four of the last five years at Arkansas. Arkansas picked up five wins over ranked opponents this season, including four at home. 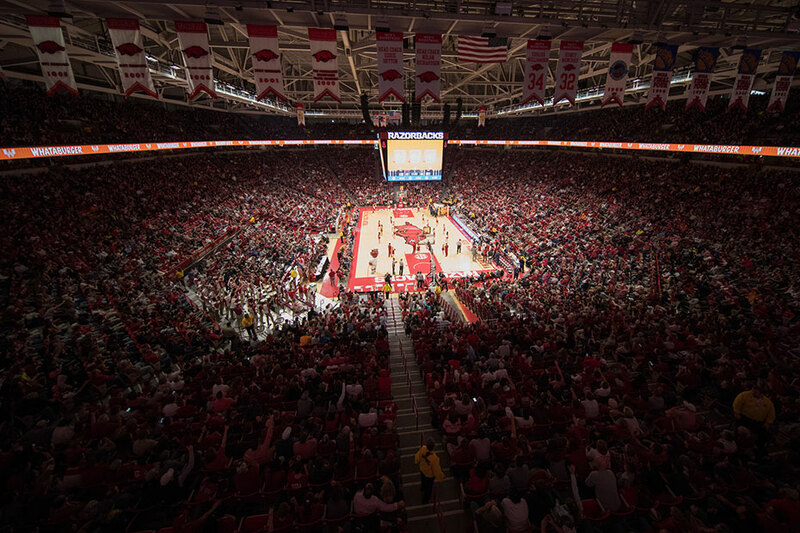 Four ranked home wins are the most in school history, as Razorback fans brought life back to Bud Walton Arena, selling out six games in the Palace, to go along with another in North Little Rock. Senior guards Daryl Macon and Jaylen Barford became the sixth and seventh players in school history, respectively, to eclipse the 1,000 career points mark in two seasons and the 42nd and 43rd players overall. Both surpassed the milestone in Arkansas’ home finale, becoming the first teammates in program history to accomplish the feat in the same game.